Dr. Deepak Kumar Mishra is a Consultant Orthopedic Surgeon in Gurgaon, India. He is currently practicing at multiple locations i.e. Medanta – The Medicity in Sector 38 Gurgaon and Medanta Mediclinic in Defence Colony, South Delhi. Dr. Deepak Kumar Mishra has more than 17 years of experience. He is a qualified Orthopedic Surgeon in Gurgaon at Medanta Hospital. His special interest includes bone diseases, fracture treatment, hand surgeries, joint and bone surgeries, joint diseases, joint replacement, spine disorders, total hip replacement, total knee replacement, revision of previously failed total knee replacement, total hip replacement and reconstructive surgeries for complex fractures. Dr. Deepak Kumar Mishra‘s vision, clinical expertise, dedication and patient centric approach have resulted in the growth of Medanta Hospital. As an Orthopedic Surgeon in Gurgaon, his area of expertise includes Gout, Rickets, kyphosis, Arthritis, Scoliosis, Stiff Joints, Osteoporosis, Spine Injury, TB of The Spine, Lumbar Spondylosis, Cervical Spondylosis, Fractures of The Bones, Hip Replacement Surgery, Disc Prolapse/Slip Disc, Knee Replacement Surgery, Gangrene of Hands or Feet, Malunion of Fractured Bones, Delayed Union of Fractured Bones, Tennis Elbow/Lateral Epicondylitis, Delayed Non-Union of Fractured Bones, Frozen Shoulder/Periarthritis Shoulder, Laurdosis (Deformities of The Vertebral Cord/ Spinal Cord) and Paralysis of Lower Half of The Body Due to Trauma (Traumatic Paraplegia). Patients from entire Gurgaon, India and across the globe come to Dr. Deepak Kumar Mishra with lots of hopes and the doctor ensures that the patients are satisfied with the treatments, with his experience and techniques he uses with his expertise in Joint Replacement Surgery. Dr. Deepak Kumar Mishra has completed his education mainly from Pondicherry. He did his MBBS from JIPMER, Pondicherry in 1996, MS (Orthopedics) from JIPMER, Pondicherry in 2000 and M.Ch (Orthopedics) from UK in 2008. Currently Dr. Deepak Kumar Mishra is practicing as a Orthopedic Surgeon in Gurgaon at Medanta Hospital. He was also conferred Fellowship in Trauma and Orthopedics from International College of Surgeons. Dr. Deepak Kumar Mishra is well known for his bright skills and precised patient care. He has presented his work in national and international conferences and has publications in peer reviewed journals to his credit. His contribution in the field of Orthopedics and joint replacement is well recognized and has been included in the list of Marquis ‘Who is Who’ in the field of medicine and healthcare for year 2009-2010. Dr. Deepak Kumar Mishra has got a vast experience in Replacement Surgeries around knee and hip joint. He uses the latest available technology for Primary Total Knee Replacement, Total Hip Replacement and Revision Replacement Surgeries. Dr. Deepak Kumar Mishra specializes in limb reconstruction surgeries for complex problems like mal-union/ non-union of long bones. He’s a proponent of minimally invasive and tissue preserving techniques. He’s also actively involved in teaching young doctors and paramedical staff. He has also been the member of some prestigious organizations like Indian Orthopedic Association, Indian Arthroscopy Society and AO Trauma. Dr. Deepak Kumar Mishra is a famous Orthopedic Surgeon in Gurgaon. 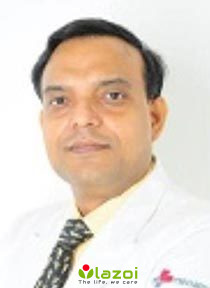 Before practicing as a Orthopedic Surgeon in Gurgaon at Medanta Hospital, Dr. Deepak Kumar Mishra was formerly a Senior Resident at JIPMER, Pondicherry (2000 – 2003), Consultant Joint Replacement Surgeon at Yashoda Hospital, Hyderabad (2010 - 2013) and Assistant Professor Orthopedics at NMCH Patna (2013 – 2015). You can book an online appointment with Dr. Deepak Kumar Mishra on www.Lazoi.com. Dr. Deepak Kumar Mishra is very good Orthopedic Surgeon and have good experience, my meeting was good and Dr. Deepak Kumar Mishra give me very good treatment. I recommend for other patient to visit the Dr. Deepak Kumar Mishra. It was talk with Dr. Deepak Kumar Mishra, by nature and experience wise Dr. Deepak Kumar Mishra is very good. I recommend for other patient to Dr. Deepak Kumar Mishra. I was visited Dr. Deepak Kumar Mishra and my meeting was good and Dr. Deepak Kumar Mishra give me very good treatment. Dr. Deepak Kumar Mishra is very good by nature and explains everything in detail. Dr. Deepak Kumar Mishra is very good and well experienced and my consultation with Dr. Deepak Kumar Mishra was very good. Nature wise Dr. Deepak Kumar Mishra is nice.